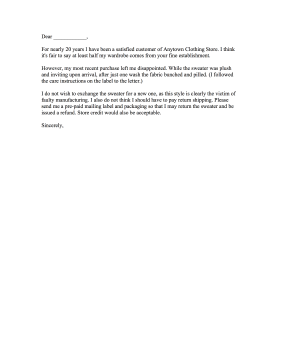 Request a refund for faulty clothing with this retail complaint letter. For nearly 20 years I have been a satisfied customer of Anytown Clothing Store. I think it's fair to say at least half my wardrobe comes from your fine establishment. I do not wish to exchange the sweater for a new one, as this style is clearly the victim of faulty manufacturing. I also do not think I should have to pay return shipping. Please send me a pre-paid mailing label and packaging so that I may return the sweater and be issued a refund. Store credit would also be acceptable.